Working in liaison with the Barn Owl Trust and funded by very generous support from Paradise Park, the group monitors over 120 Barn Owl nestboxes around the county. These are visited twice annually to monitor the breeding adults and also to ring the chicks prior to fledging. This allows us to monitor the success of the breeding season and also to monitor the dispersal of young birds away from their natal areas. 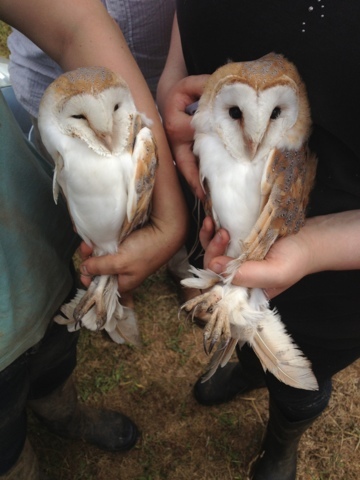 Anyone with Barn Owls breeding on their property who would like to join the monitoring scheme is encouraged to get in touch with us to arrange a site visit. 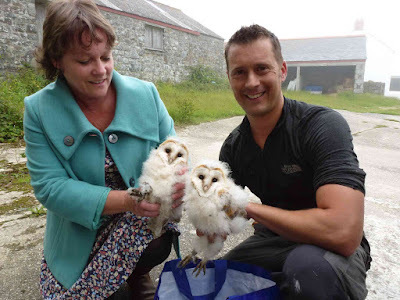 Many subsequent reports of our ringed Barn Owls come from members of public who find them dead. The most common causes of death reported are collisions with vehicles and drowning in water troughs. The apparent decline in occupancy in 2012 and 2013 may have been due to the inclusion of newly-erected boxes, some of which were not at traditional sites, hence were less likely to be occupied. The large numbers of non-breeding birds seen in 2011 wasn’t replicated in 2012, and whilst clutch sizes were slightly smaller this year, average brood size remained around the same level. 2013 saw one of the worst years for Barn Owls across the country, with a large numbers of sites unoccupied for the first time in many years. Those that did breed had smaller clutches and smaller broods than in previous years. In contrast, 2014 was an excellent season, with much larger broods of chicks seen and over three times as many chicks ringed as in 2013!